UN-Habitat’s Mosul Portal portal intends to give an overview of the known rehabilitation efforts to support coordination and recovery planning in all of Iraq. It is made possible among others by UNDP and Ninewa Governorate. The latest overview of schools, made possible by UNICEF and Education Cluster is now online. In east Mosul, the education sector is slowly recovering. At least 144 schools have been rehabilitated by various organisations, with another 30 planned for rehabilitation. Furthermore, it shows that in west Mosul, a large amount of schools were severely damaged during the liberation process. The latest water dashboard is now online. The dashboards shows that most water treatment plans are planned for rehabilitation or started functioning again, with the notable exception of the Old City area. Nevertheless, access to water is limited due to the limited capacity of plants, and the destruction of the water network. This dashboard was produced based on input from the Department of Water and Water Treatment Plant working group. A preliminary debris assessment of Mosul is now online. This initial mapping estimates that there is almost 11 million tons of residential debris as a result of the destruction in the city. This is a preliminary estimation that should be regarded as an absolute minimum and is subject to verification in the field. The actual amount may be several factors higher, among other due to the expected voluntary demolition of severely damaged buildings. This assessment was produced by UN Environment, Disaster Waster Recovery and Urban Resilience Platform facilitated by data provided by UN-Habitat’s Mapping and Data Portal. The latest bi-weekly damage assessment is now online. 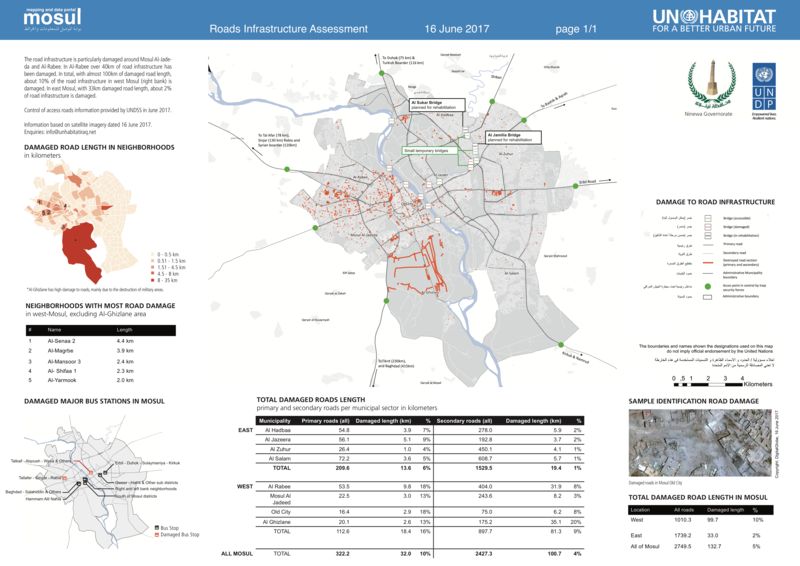 It shows that between 16 June and 8 July 2017, most observed damages have occurred in western Mosul (right bank), where clashes have hit residential neighbourhoods. The Old City was hit the hardest and the area has seen an additional 5393 heavily damaged or completely destroyed sites since 16 June 2017. Information based on satellite imagery dated 8 July 2017. The latest infrastructure dashboard shows that the road infrastructure is particularly damaged around Mosul Al-Jadeda and Al-Rabee. In Al-Rabee over 40km of road infrastructure has been damaged. In total, with almost 100km of damaged road length, about 10% of the road infrastructure in west Mosul (right bank) is damaged. In east Mosul, with 33km damaged road length, about 2% of road infrastructure is damaged. 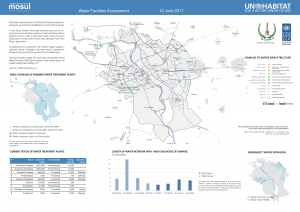 In west Mosul, however, three water treatment plants are not running yet, leaving in particular residents in north-west Mosul without adequate access to water. In west Mosul, water trucking by various organisations is covering some of these areas, although in north-west Mosul a gaps still remain. The latest bi-weekly damage assessment is now online. 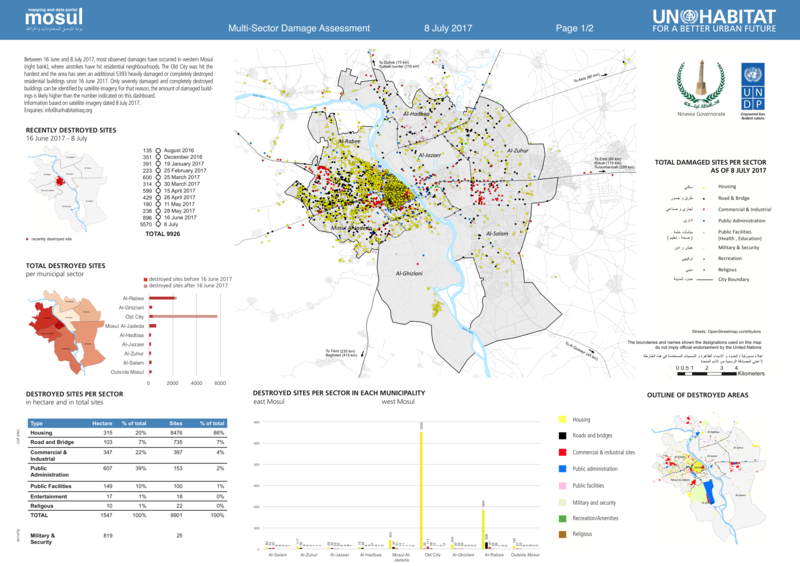 It shows that between 11 May and 28 May 2017, most observed damages have occurred on the right bank (western Mosul), where airstrikes have hit residential neighbourhoods. As in previous weeks, Al-Rabee was hit the hardest and the area has seen an additional 238 heavily damaged or completely destroyed residential buildings since 11 May 2017. Information based on satellite imagery dated 8 March 2017. The assessment was carried out by UN Environment / OCHA joint unit.